The USS Saratoga ball cap that Tom Capstraw wore on Wednesday was not a tricked-up accessory to his NYRA-issued red vest, white shirt and black bow tie. It was “Proud to be an American” day at the track, and Capstraw, an usher in Section J who served 17 months on the aircraft carrier and four years in the Navy before 25 years as a postal worker, was going along with the theme. Sometimes the track puts on an event and you hardly realize it. But this wasn’t one of those. NYRA might have run out of armed service representatives to name the races after, but patriotic music filled the air and men in uniform were everywhere. Playing a prominent role in the afternoon’s proceedings was a musical group called the Music Studio Kids. Ages seven through 16, and 25 strong, the little darlings were wrapped in the flag and cavorted about like the Mickey Mouse Club. Nine-year-old Anthony Gargiula, famous for singing “New York, New York” at Big Brown’s Belmont Stakes fiasco, was okay as a soloist, but he’s quickly becoming Wayne Newton-ish. In any case, Gargiula belted out “Yankee Doodle Dandy” and, of course, the awestruck crowd loved it. Spy in the Sky, the 4-year-old lightweight, won the $70,000 Happy Intellectual Stakes, a 2 3/8 miles hurdles race, by nipping the 9-5 Swagger Stick at the wire. Then Thats a Good Thing, trained by Steve Asmussen, stumbled out of the gate, came on like a freight train and won the second race – a maiden $100,000 claiming six-furlong sprint called the Veterans. The New York National Guard purse was won by Calling the Colors. The US Coast Guard Academy purse was taken by Indian Hawke. The Air National Guard purse belonged to Majestic Blue, and then the race names became civilian. Of the four races named for the military, Majestic Blue’s was the most meaningful. A 2-year-old Darley Stable colt, Majestic Blue broke his maiden on his first try. Moreover, he gave Alan Garcia a lead in the meet’s jockey race. The 22-year-old Garcia won the next race with Stream of Gold, an Irish-bred 7-year-old gelding. Stream of Gold, like Majestic Blue, was saddled by Kiaran McLaughlin. With back-to-back victories, McLaughlin, like Garcia, took the lead in his own category, which would be leading trainer. The featured Mollie Wilmot was won by a 22-1 longshot that left many astute handicappers scratching their heads. Mike Luzzi had the rail with Cagey Girl. His filly was the lone speed. David Duggan, successful with nearly 40 percent of his runners, was the trainer. 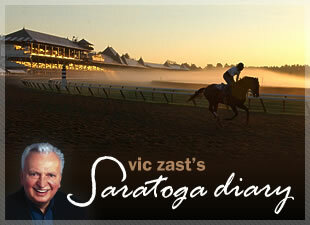 Besides, Cagey Girl was four out of five in the money on the Saratoga turf courses.